The Rapid Rapid Fire Camera Shoulder Strap by Altura Photo is designed for ultimate comfort, security and speed. This cross-body design is ideal for all DSLR, mirrorless, or compact system cameras. The ergonomic shoulder pad fits on either shoulder allowing the camera to hang on either side, close to the hip, to capture the moment in a split second. Stress on your neck and back is a thing of the past. 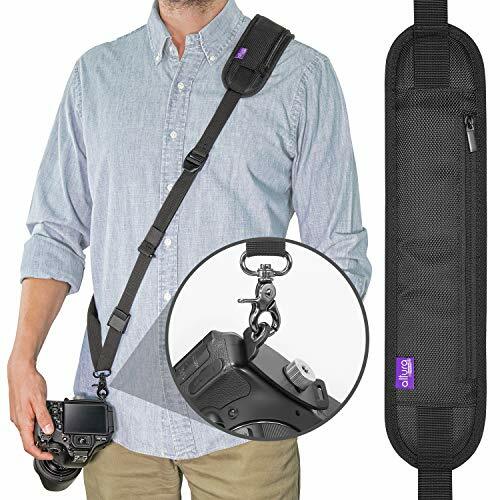 Whether you shoot indoors or out, weddings, wildlife, sports, or events the Rapid Fire Camera Strap by Altura Photo will have your camera secured close to your hip, out of the way, and ready in an instant. – Designed for DSLR, mirrorless, and compact system cameras with a standard 1/4 tripod mount.